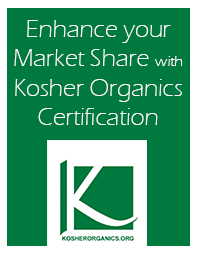 Registration Information — You will provide us information about yourself, your firm or company, and your practices when you register to be a participant of the Kosher Organics Guide, register for certain services, or register for email newsletters and alerts. You may also provide additional comments on how you see the Kosher Organics Guide servicing your needs and interests. What Are Cookies? — A cookie is a very small text document, which often includes an anonymous unique identifier. When you visit a website, that site’s computer asks your computer for permission to store this file in a part of your hard drive specifically designated for cookies. Each website can send its own cookie to your browser if your browser’s preferences allow it, but (to protect your privacy) your browser only permits a website to access the cookies it has already sent to you, not the cookies sent to you by other sites. Sharing Information with Third-Parties — We may enter into alliances, partnerships or other business arrangements with third-parties who may be given access to personal information including your name, address, telephone number and email for the purpose of providing you information regarding products and services that we think will be of interest to you. In connection with alliances, partnerships or arrangements, we may also provide certain information to third-parties if we have determined that the information will be used in a responsible manner by a responsible third-party. For example, some of our partners operate stores or provide services on our site, while others power offerings developed by us for your use. We also use third-parties to facilitate our business, including, but not limited to, sending email and processing credit card payments. In connection with these offerings and business operations, our partners and other third-parties may have access to your personal information for use in connection with business activities. As we develop our business, we may buy or sell assets or business offerings. Customer, email, and visitor information is generally one of the transferred business assets in these types of transactions. We may also transfer such information in the course of corporate divestitures, mergers, or any dissolution. Notice of New Services and Changes — Occasionally, we may also use the information we collect to notify you about important changes to our website, new services and special offers we think you will find valuable. As our customer, you will be given the opportunity to notify us of your desire not to receive these offers by sending us an email request at info@lollywebdesigns. How Do We Secure Information Transmissions? — Email is not recognized as a secure medium of communication. For this reason, we request that you do not send private information to us by email. Some of the information you may enter on our website may be transmitted securely via Secure Sockets Layer SSL, 128 bit encryption services, which are enabled by a reputable SSL certificate provider (Thawte OR Verisign). Pages utilizing this technology will have URLs that start with HTTPS instead of HTTP. Please contact info@lollywebdesigns.com if you have any questions or concerns.